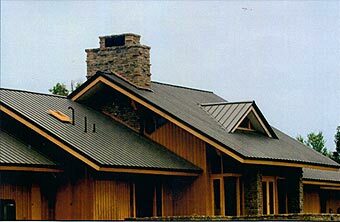 Protect your most important investment with beautiful, durable, metal roofing. Available in multiple styles and colors. 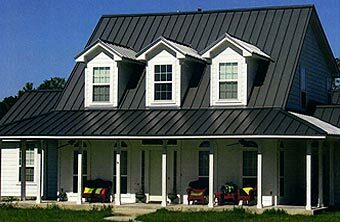 There's a metal roofing style to match your home's exterior. 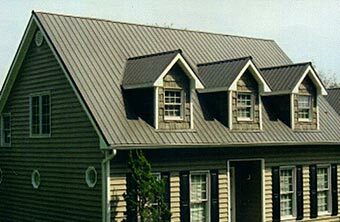 A metal roof adds a distinctive flair to your home while increasing its value. Today's metal roofing can look just like common roofing materials such as asphalt shingles, clay tile, or even cedar shake, or slate. While the initial cost for a metal roof is higher than most other roofing materials, you'll save money in the long run. Roofing materials, like asphalt, require re-roofing about every ten to twenty years. Metal roofs last 2-3 times longer than non-metal roofs, chances are, install a metal roof and it will be the last roof you ever have to buy. Most metal roofing materials come with a manufacturers warranty. To further add to your savings, a metal roof can save you up to 40% on your annual energy costs. Both light and dark colored metal roofs reflect heat to reduce cooling costs in the summer and insulate homes during the winter. Metal roofing is kind to the environment too. Most metal roofing is composed of recycled materials and can often times be installed directly over top of an existing asphalt roof. This reduces landfill waste while allowing for quick installation and decades of maintenance-free durability and appearance. 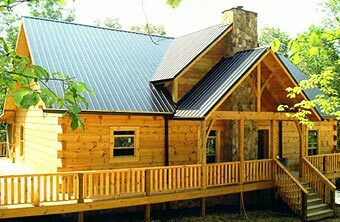 Standing seam roofing panels have been used on traditional and contemporary homes for more than a century. Their clean, graceful lines have been an enduring favorite on a wide range of architecture. Apex Standing Seam is a premium standing seam panel that is designed for distinctive, high-end looks. It's popular in up-scale residential and commercial applications. Apex Standing Seam panels snap securely together with completely concealed fasteners for maximum wind and weather resistance. MajesticRib is used in a wide range of applications, including residential, commercial and post-frame buildings. Featuring classic looks, this versatile and popular panel is an industry leader in durability and strength. To increase strength and to ease handling and installation, MajesticRib was designed with extra-wide ribs. Additionally, the oversized anti-siphoning channel on the under-lap rib provides extra resistance to leaks in the presence of extreme rain loads and wind.